Sennheiser ew 300 IEM G3; an incredible wireless in-ear monitoring system. Using adaptive diversity to eliminate dropouts and interruption, ..
Sennheiser ew 300 IEM G3; an incredible wireless in-ear monitoring system. Using adaptive diversity to eliminate dropouts and interruption, the G3 delivers amazingly high reception quality. Trusted by professionals all over the world, Sennheiser monitoring systems just got a whole lot better. Setting the bar high with the Sennheiser G2 personal monitoring system, the new Sennheiser G3 takes the wireless monitoring system to new heights and allows you to hear and perform better than ever before. To ensure reliable performance allowing you to have the confidence you need when performing, Sennheiser have made use of adaptive-diversity receiver technology. With this useful design, the headphone cable acts as a secondary antenna – when the receiver detects interference or that dropout will occur, it seamlessly switches to the next antenna. The body pack features Easy Setup which automatically scans the frequency banks for an open frequency and once complete Easy Setup syncs with the transmitter via infra-red to transfer data from the receiver. Sturdy metal housing protects the receiver pack to prevent damage so you can be as active and energetic as your performance demands, safe in the knowledge that your wireless monitoring system will be well shielded. The in-ear monitor headphones come with various ear-fitting pads that allow for an individual, comfortable fit while reproducing the signal from the adaptive diversity receiver with precise accuracy. Similar to the receiver body pack, the transmitter unit is housed in a rugged metal casing so that it is well protected when you take it on the road and can withstand the associated bumps and bangs of being lugged around from show to show. 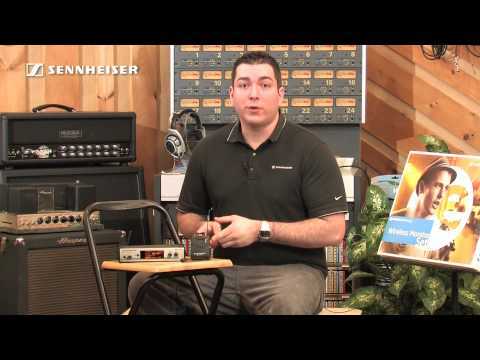 Pass-through outputs allow you to easily incorporate your wireless transmitter with other devices and split the input signal while combination XLR and 1/4-inch input jacks allows connection for a wide range of microphones and other audio sources. Thanks to an integrated Ethernet port, your audio can be monitored and controlled remotely with the Sennheiser Wireless Systems Manager software via your PC or Mac. The large, brightly lit display allows for easy viewing, even on the most dimly lit stage and other adverse lighting conditions. With Sennheiser taking their industry-leading wireless technology and upgrading it to the G3 edition, the Sennheiser ew 300 IEM G3 makes for an extremely useful, reliable and high quality wireless monitoring system.